Guests will travel via bus from Sacramento to Fort Bragg located on the California North Coast where you will board the world famous Skunk Train. Built as a logging railroad, the Skunk Train travels through the majestic California coastal redwoods to Northspur. The train has coaches and open-air observation cars to view the incredible scenery. At Northspur, guests will disembark to walk around and view the beautiful surroundings. 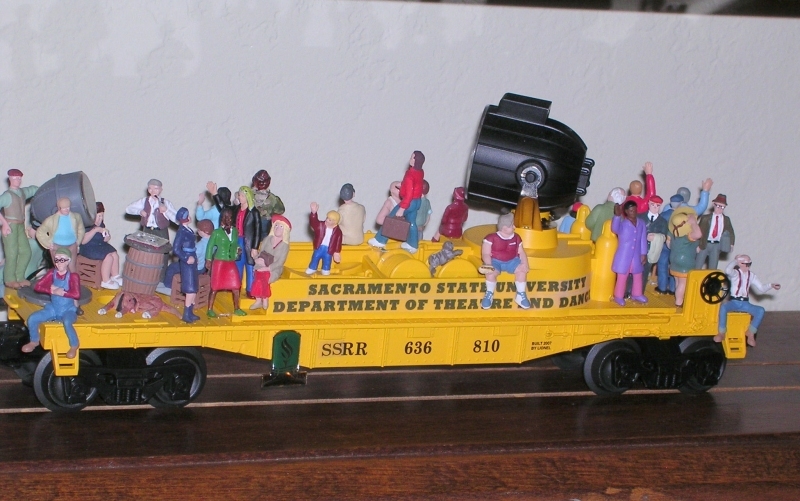 A dinner stop (price not included in the tour price) is planned on the return bus trip from Fort Bragg to Sacramento. Please note that the bus trip from Sacramento to Fort Bragg is approximately 4 hours. This Convention Tour is limited to 80 guests. 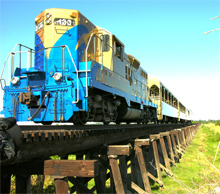 Guests will travel via bus from Sacramento to the Western Railway Museum in Suisun City to visit the Western Railway Museum. With over 100 pieces of equipment the museum features one of the world’s most complete collections of interurbans, streetcars, PCC’s, parlor cars, and electric locomotives. Our guests will enjoy a trip on the museums electrified railway in restored interurbans or trolleys. The museum also offers a book/ souvenir shop, a library, and archives. Our guests will enjoy a boxed lunch served on the museums shaded picnic grounds. After lunch, our bus moves to the Jelly Belly Factory and Visitor Center in Fairfield for a tour to see the Jelly Belly candies in production. The Jelly Belly Candy Company is a family owned business established in 1869. The company achieved additional fame when it became known that President Ronald Regan kept a jar of Jelly Belly beans in the Cabinet Room and Oval Office in the White House. 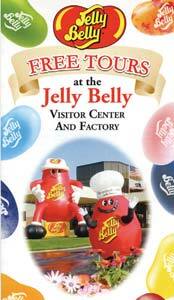 After the tour enjoy the gift shop or if you are still hungry try a Jelly Belly shaped pizza or hamburger in the café. Our last stop of the day is the Tractor and Truck Museum in Woodland. The museum features the world’s largest collection of antique tractors and agricultural equipment in the world. 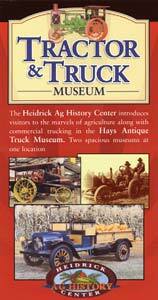 Also inside the museum is the Hay’s Antique Truck Museum, also recognized as the largest of it’s kind in the world. In addition to the real trucks and tractors the museum has a sizeable collection of toy trucks and tractors on display. Guests will enjoy a sumptuous three-course dinner while aboard the Sacramento River Train. 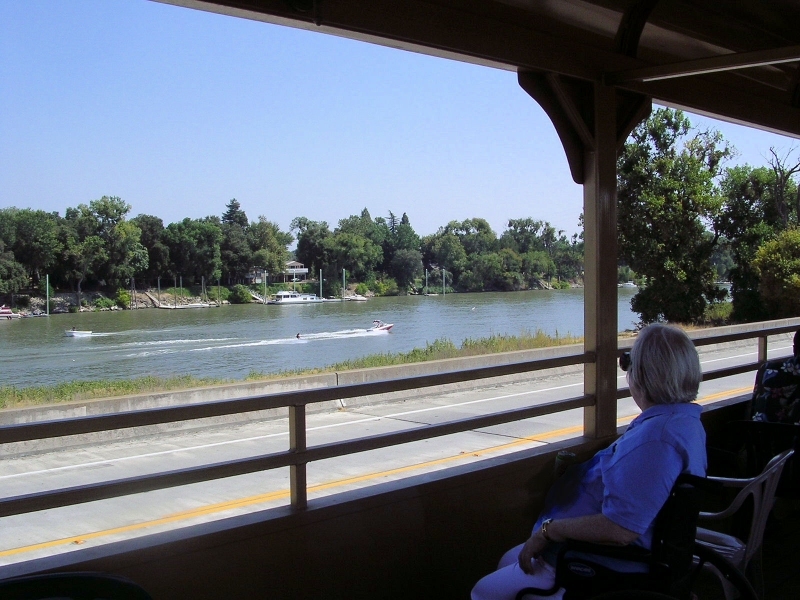 The train travels 28 miles through scenic farmland, along the Sacramento River and over the longest wooden trestle in the Western United States. Guests may relax in the 1940’s vintage Pullman Coach-Club Car while enjoying live entertainment. A drawing will be held and four lucky winners will receive a half hour ride in the Sacramento River Train circa 1950 locomotive. This Convention Tour is limited to 110 guests. 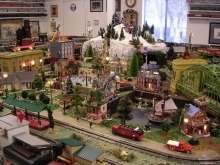 Guests will travel along California’s Highway 49 from Auburn to the historic towns of Grass Valley and Nevada City to visit the fabulous layouts described below. Please note that all four layouts are up or down stairs, so persons with limited mobility must exercise caution. A charter member of TTOS, Clyde loves prewar toy trains, and he also loves Erector and Meccano construction sets. Therefore, he has combined both hobbies into his fascinating, all prewar, 33' by 26' layout. 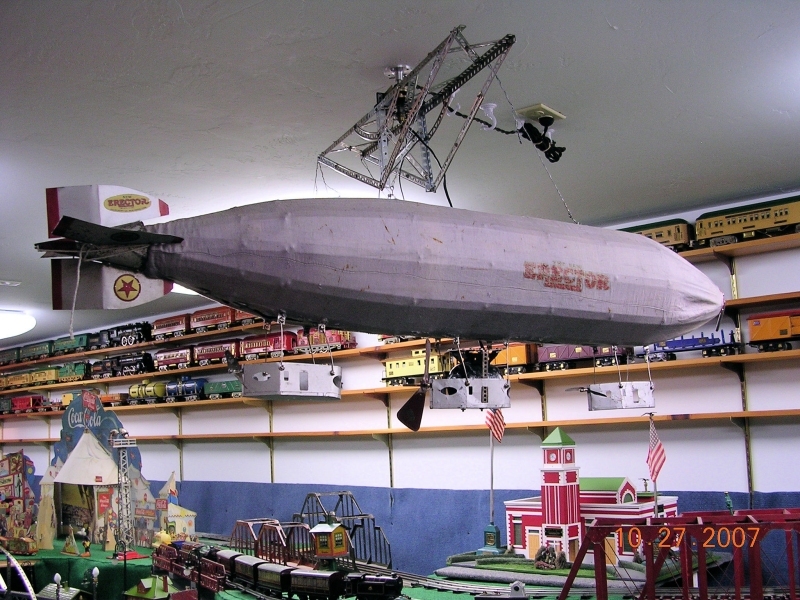 Standard, O, and #1 gauge trains operate under a powered Erector Giant Airship and a tri motor plane suspended from the ceiling. 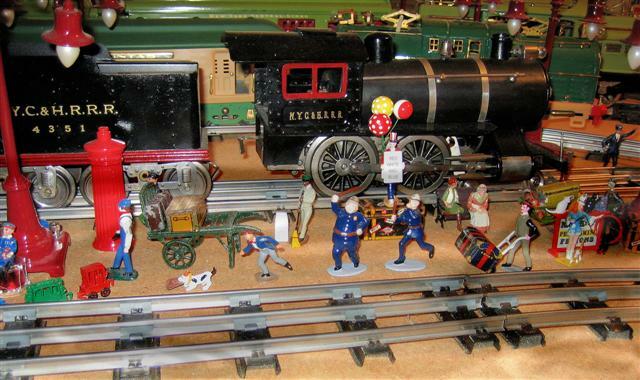 Clyde’s collection dates from the turn-of-the-century through the 1930’s was featured in Classic Toy Trains January 1998. 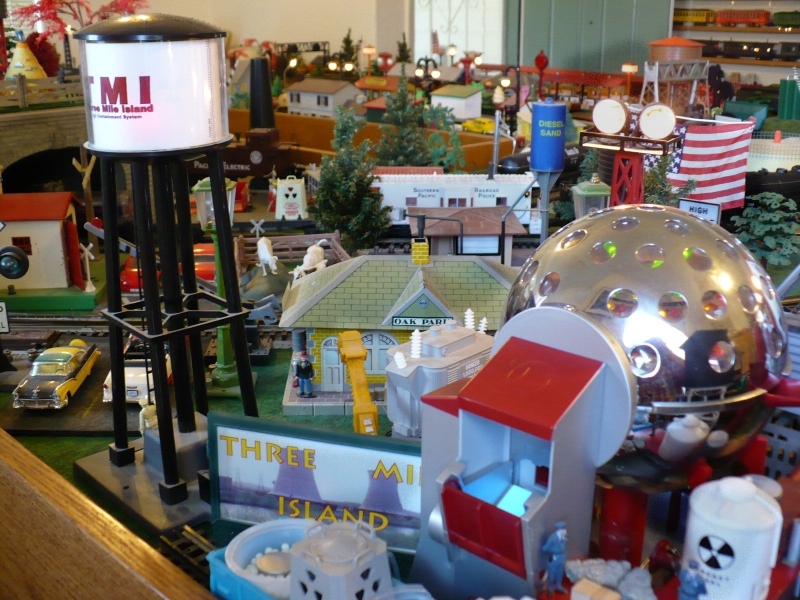 In a program featuring collectors, the local PBS station described their home as an amazing playroom filled with hundreds of toy trains, railroading memorabilia, and accessories — all in mint condition. Watch for Erma’s touch in the Disney trains and collectibles. Chuck’s collection of original, prewar standard gauge trains has been featured twice in Classic Toy Trains, in Tracks Ahead and in the TM Great Toy Train Layout book and video – and with good reason. 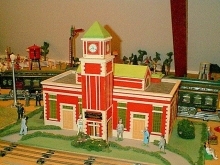 Guests will see all of the important Lionel, Ives, and American Flyer named trains from the Classic Standard Gauge Era, the race track, the Lionel airplane, rare stations and other buildings, and dozens of other accessories – all dating prior to 1939, all operating and all in mint condition. 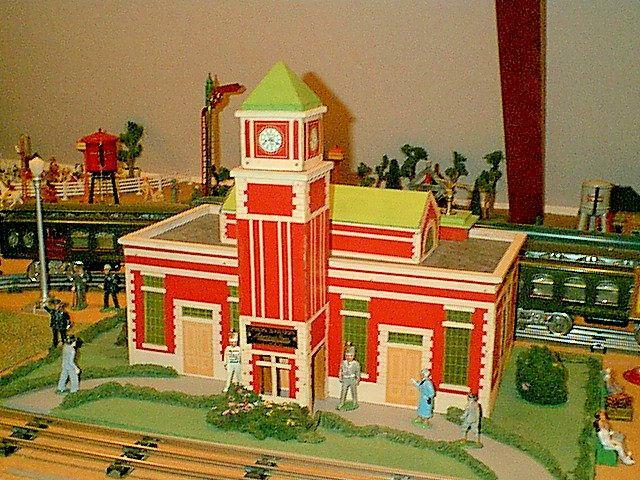 Chuck has twice added on to his original train room, and the layout now measures 20' by 88'. This historical layout shouldn’t be missed. Chuck is also a charter TTOS member. 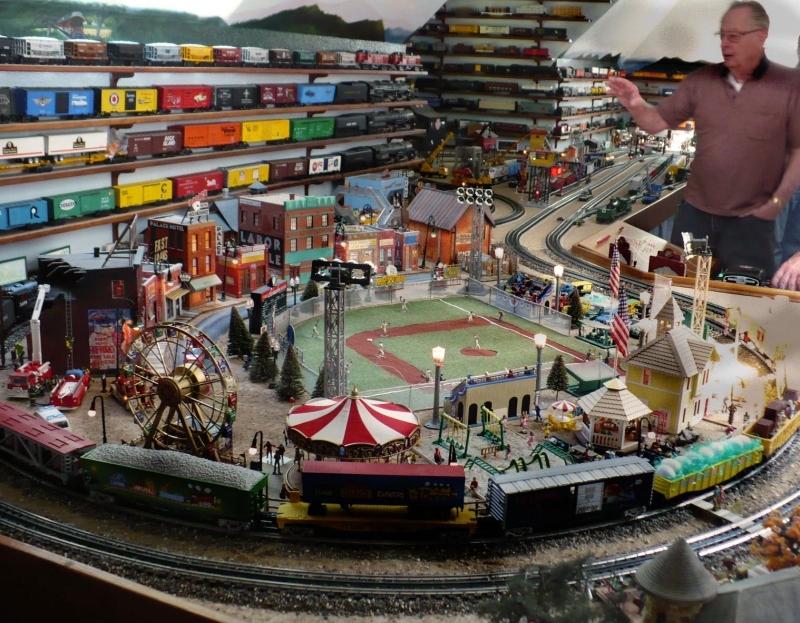 “Ives Toys Make Happy Boys” is a great description of Chuck and his collection and layout. This over-the-garage layout with a standard gauge 41 foot straightaway will take your breath away. 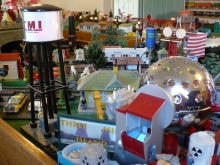 Guests will see one of the finest collections of original Ives trains and toys in the West. Prewar Lionel and America Flyer and a nice collection of European trains and their associated accessories are also displayed. Chuck also collects and displays early toys. On the tour, look for early Marx toys, made long before Marx got into the train business. Jeri’s antique doll collection will be an extra treat. 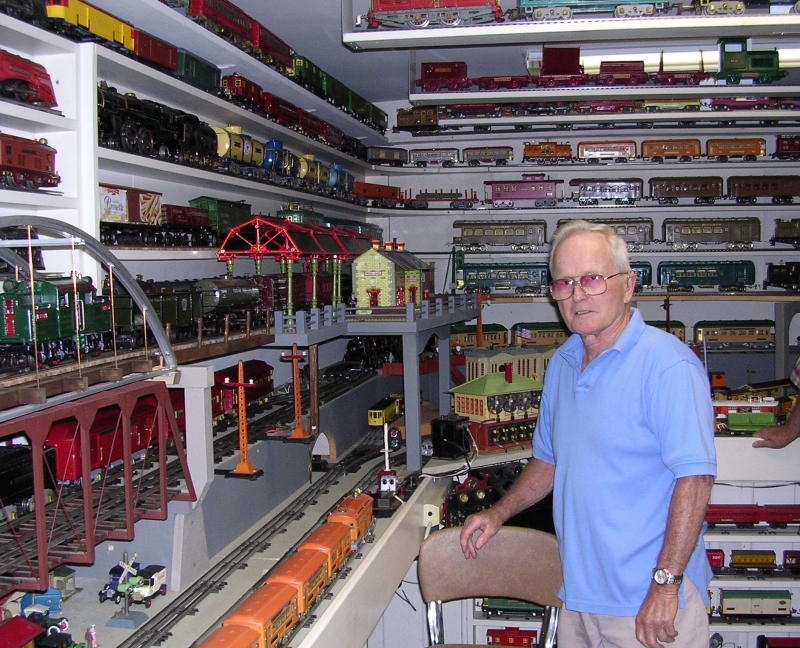 Bill’s layout and collection bring us into another time period. The shelves in his train room showcase his large collection of postwar to modern trains including many 3rd Rail and Williams brass engines and rolling stock. Bill’s imagination and creativity, coupled with his attention to detail in his scratch built structures, enhance this delightful high rail layout. The gem of the layout is a baseball park with music and game sounds plus an operating merry-go-round and Ferris wheel with lights, sounds, and people. Visitors are sure to love the train room with its stunning overhead murals of mountains and sky. Guests will enjoy a full three-course luncheon while riding through the rolling hills on the Sierra Railroad. Your meal includes a salad, main course, desert, and beverages. In addition to the dining cars, the train includes a open air observation car where guests can enjoy the scenery along the trip. There will be a raffle for two guests to ride in the cab of the locomotive for a half hour each. This Convention Tour is limited to 86 guests. Karl is a gifted artist who likes to bring discarded trains and toys back to life, so look for some truly outstanding restoration projects. Karl’s restored prewar standard and O gauge trains appear as they would have when they were taken out of their boxes many years and many kids ago. The crown jewel of his collection is his operating 3-rail, No.1- gauge layout. The collection is upstairs so wheelchairs won’t work. In a spare bedroom which has been converted into a large layout room Pete runs trains high and low. 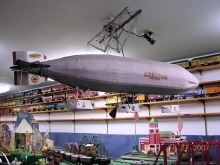 His O gauge trains, including a monorail, run on track hanging from the ceiling. On the layout itself Pete runs standard gauge trains with lots of activity and many operating accessories. In the rest of their home, collections of antique toys, toy soldiers, and Western memorabilia will make your visit even more delightful. Again, the trains are upstairs. Dean’s layout is built around an original 5' x 9', Super O, Lionel dealer display, No. D-291, which Dean has restored to its original condition including the original accessories. Surrounding this is his 16' x 18’ modern, multi-loop layout with Ross track and switches and featuring the new Ross transfer table. The many clever scenes around the layout reflect the theatrical set design backgrounds of both Bonnie and Dean. The train building and shady patio have access for handicapped. 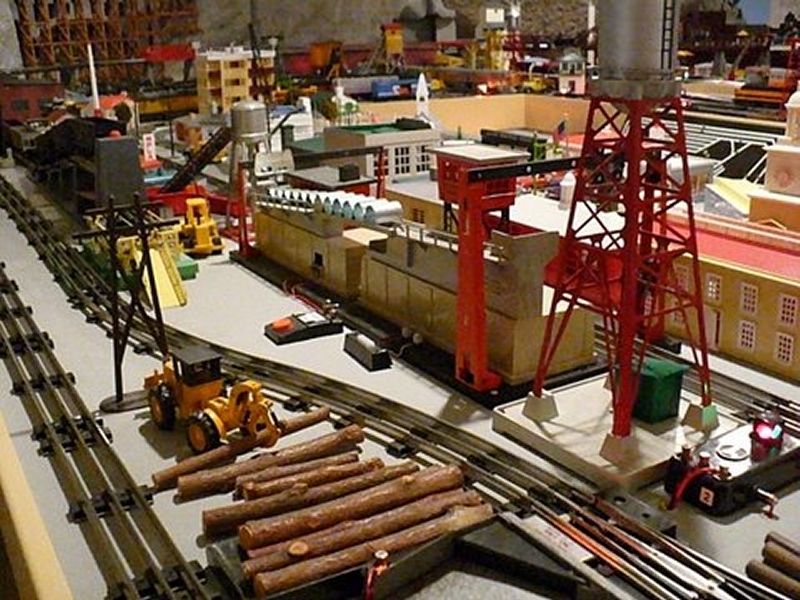 Fans of postwar trains and accessories will love Phil’s layout. Phil added a room to his house just for his amazing 34' x 18' rail empire. The layout uses original ZW transformers and old-style Lionel O-gauge track with multiple loops on several levels. Almost every accessory, from postwar to modern, is featured and they all operate. 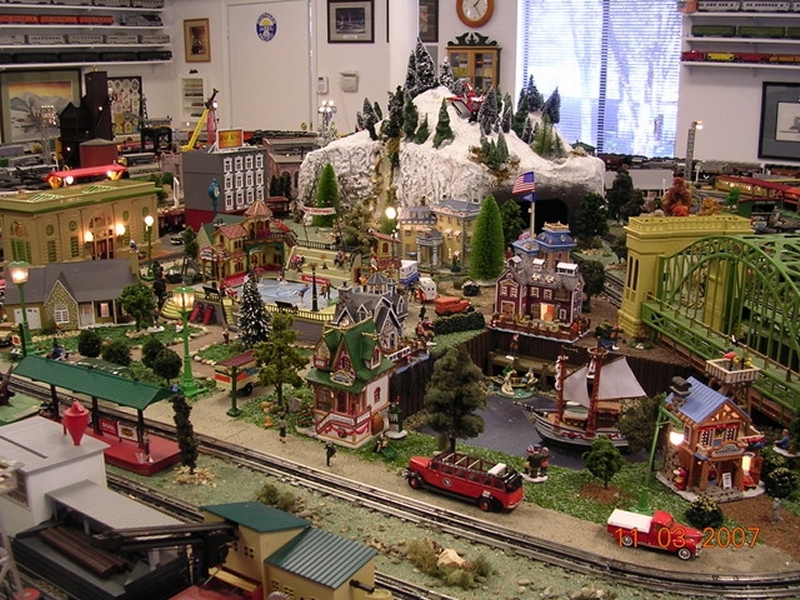 The exciting operation of the three-level railroad empire is enhanced by the structures and imaginative scenery that Phil designed and created. Wheelchair accessible. This outstanding 21' x 18' layout, housed in its own building, is always a favorite. Mike runs DCS, TMCC and conventional trains on the same loop at the same time. The 96- inch outside diameter track, the six-stall operating turntable and the coaling tower will appeal to the operator, while the fully scenic layout with its operating ice rink, snow-covered mountain and many operating accessories will intrigue the high-railer. Easy wheelchair access. Look for surprises here, starting with the location of the 11' x 17' layout – smack-dab in the middle of the living room. A former nuclear engineer, Jack likes reactors, so you’ll see a couple. 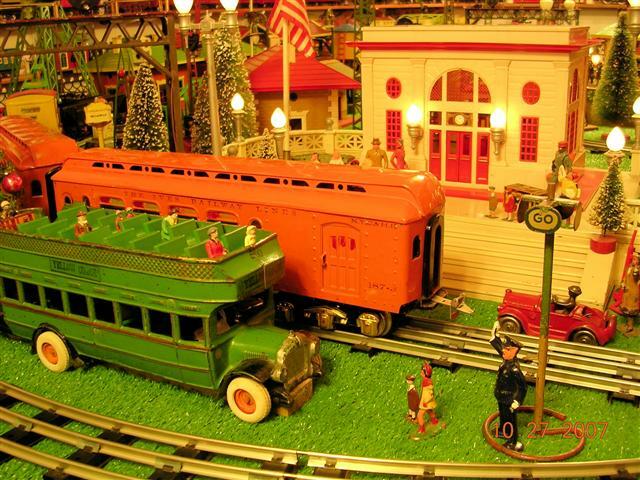 The GASP railroad is a mixture of whimsy and state-of-the-art electronics. Not for the purists, you’ll see several gauges and several eras represented. 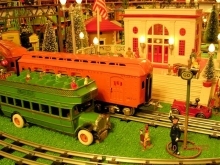 The layout was featured in the February 2003 issue of Classic Toy Trains. Easy wheelchair access.